Despite smartphone ownership in the US doubling in the past five years, there are many people who still do not have access to Mobile Internet Devices (about 102 million at last count). However, 98% of the population does have access to a cell phone or other device capable of receiving SMS text messages. This is why a lot of nonprofits, businesses, and even emergency response teams take advantage of text blast software to quickly broadcast messages in a format that almost everyone can receive very quickly. A 'text blast' is an SMS text message sent from a single source to a large group of people simultaneously. Most often used in the retail industry, sending a text message blast has been identified as the most effective way for businesses to connect with customers, raise brand awareness, and increase purchasing intent. Outside of the retail industry, many organizations use the services provided by their text blast service to communicate with their members. Many people have received a text blaster from their church, their political party, their football team, or even their employer. SMS technology is by far the most preferred way to send a text blast. Due to the fact that 98% of the population possesses the technology needed to receive an SMS text blast, it's the most efficient way to reach everyone. Some organizations have tried to use messaging apps as a substitute for sending SMS texts. The problem with instant messaging apps is the deliverability. Even the best messaging apps have limits on the number of contacts that can be sent a message at the same time. Furthermore, everybody subscribed to receive messages from an organization using a messaging system, like email or instant messages, must have the particular app downloaded and have access to the Internet in order to receive the messages. One of the reasons that emergency services choose to use SMS-based emergency technology is that data networks can get overloaded during crisis situations. SMS Messages can still get through when phone calls, emails, and MMS messages may fail. Schools, employers´ organizations and hospitals tend to use these services for the same reasons. Furthermore, sending a mass text from a computer is quick, easy and inexpensive. In order to send a text blast from a computer, you have to sign up for an account with a service provider. Usually opening an account is free, and most text blast companies offer a choice of packages depending on your anticipated use of the service. Some offer free trials so you can become familiar with sending a text message blast from a computer, or provide a pay-as-you-go option. Once you have opened your account, you are able to log into the service provider´s browser-based text messaging platform. With the platform open, you simply upload your list of contacts, write your message, and click send. Within minutes, your message will be received and read by your contacts, with any replies being sent directly back to the platform. Because the best software to use is browser-based, you can log into your account from any device that has Internet access. This means that when you send a text message blast from a computer, you do not have to sit by the computer waiting for replies. Measuring the Success of Your Text Blast: You can check delivery rates, open rates, and spikes in engagement - and read your replies - from any device at any time. Mobile marketing is effective because of the intimacy and immediacy of text messaging. Research has found that more than 90% of Americans keep their mobile devices within reach at all times of the day, and most people tend to reach for their cell phones or smartphones as soon as they hear the ringtone of an incoming message. As a result, 94% of text messages are opened and read within three minutes of receipt, compared to a three-minute open rate for email of just 22%. Direct mail and Social Media Marketing have even poorer response rates - just 29% of Tweets and 12% of Facebook posts are ever read - while SMS marketing performs four to five times better than online advertising for creating brand awareness and increasing purchasing intent. SMS marketing uses a channel of communication that most people are familiar with. You do not have to have any special technical skills to send a text message and, because people tend to reach for their mobile device as soon as they hear its ringtone, you do not have to design a creative advertisement or write an attention-grabbing headline for your message to be read. The option to save sent messages as templates so that you can use them again for future messages. This saves you time composing the same message multiple times if you run recurring campaigns. The option to divide your list of contacts into groups. By sending a text message blast from a computer to only those people for whom it is relevant, you avoid “wastage” and reduce your marketing costs. The option to complement - or replace - plain text messages with multimedia files such as images, video, and audio to increase the impact of your messages. As they say: “a picture is worth a thousand words”. The option to personalize your text messages with the recipients´ names. This particular feature helps to develop brand awareness and foster a relationship between the organization and the recipient. The option to integrate tiny URLs into your text message or attach digital coupons and QR codes. When attached to a text blast, digital coupons have a redemption rate up to eight times higher than when attached to an email. 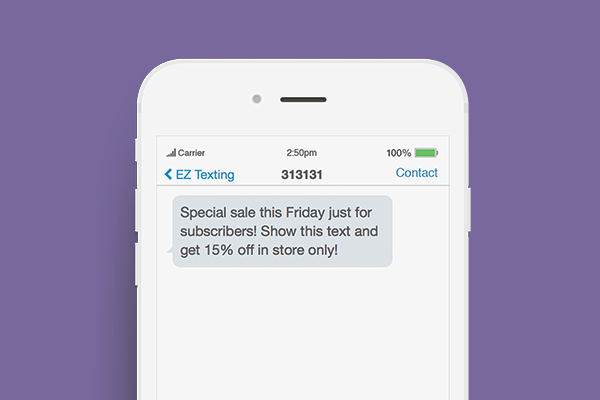 See All EZ Texting Features! Because of the potential for SMS marketing to be abused by spammers and hackers, you cannot simply purchase a list of cell phone numbers and upload it to the text marketing service. Sending a text blast from a computer - or from any device - is a permission-based activity and you have to build a text blaster contact list from scratch or from a database of customers that have already given you their permission to contact them. There are various tools you can use to build your customer database, but none are more effective than keywords and short codes. 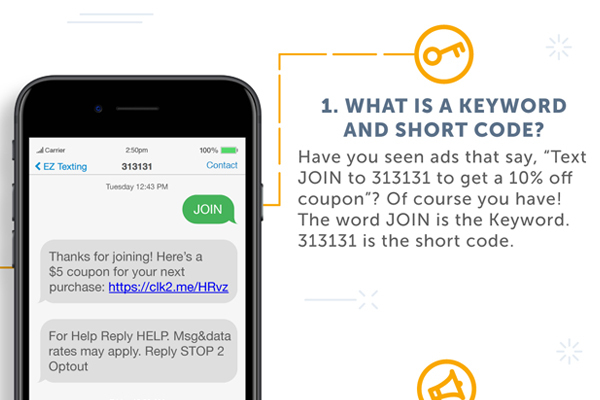 Keywords are the words you invite a potential customer to text to a short code number in order to take advantage of a promotion (for example text “discount” to 313131). When the potential customer texts the keyword to the short code number, they are added to your database and opted in to receive future text messages. Keywords and short code numbers are often included in a subscription package or can be rented from text blast software companies. These companies can also supply other marketing tools such as “Click-to-Join” widgets that you can place on your website or Facebook page. “Click-to-Join” widgets can be an effective way to attract online visitors, especially when visitors are promised they will be the “first-to-know” about forthcoming deals and promotions. As many marketing executives will confirm, marketing is not simply about getting your message heard. It is about generating engagement, developing brand awareness and increasing purchasing intent. There are several ways in which a text blast for business can achieve this. Three have already been mentioned - tiny URLs, digital coupons and QR codes. All three are particularly effective at generating engagement, but we would like to add a little more about tiny URLs. It has been reported that SMS marketing messages containing tiny URLs have a ten times higher click-through rate than emails containing the same URLs. This is an important consideration when marketing to the 15 to 25-year old “Text Generation” demographic. The 15-25 year age group is considered one of the most valuable consumer demographics, yet one of the hardest to engage. However, brands using a text blast for business to complement other forms of marketing report reaching up to 95% of their target audience. Polls are another way in which a business can generate engagement, develop brand awareness and increase purchasing intent. Polls are easy to build into text blast marketing. It was mentioned at the beginning of this article that there are plenty of non-commercial uses for a text blast service and many people will have been exposed to a “text blaster” without possibly realizing it. Non-profit organizations have found many non-commercial uses for a text blast service. A text blaster can be used by a church to solicit donations or assistance for those in need, by a community group to remind individuals about forthcoming meetings, or by a political party to “Get Out the Vote”. Due to data networks often being overloaded during crisis situations - and because SMS texting has a greater and immediate reach - employers, schools and emergency services use SMS technology to send emergency text blasts. The immediate reach feature is also an advantage when advising contacts of meeting cancellations or last-minute venue changes. The best text blast software will even advise you who has read your message so you can manually call anybody who may not be aware of an important or adverse event. Employers can also send a text blaster to advise jobseekers of work opportunities, while schools can send permission slips to parents attached to a text or increase attendance at forthcoming organized events. Some of the more unusual uses of a text blast service include a lost pet finders´ service, a weather alert service for fans attending football games, a service to help lost delegates at conferences, and a radio music request service at Power 105.1 in New York. The rules for sending a mass message are quite rigid and contained within the Telephone Consumer Protection Act (TCPA) of 1991. The Act contains rules and regulations about building a contact list, giving contacts the option to opt out of your text blast service and specifying the frequency and number of messages that can be sent to prevent spamming. As well as the TCPA, there is a “Code of Conduct” prepared by the Mobile Marketing Association with assistance from Yahoo, Microsoft, and Verizon. Although the “Code” includes guidelines for text marketing, it contains certain safeguards to protect individual privacy standards and avoid the introduction of further regulations. Even if your organization is not intending to use a text blast service for marketing, it is advisable to be familiar with the “Code”. Finally, all text blast activity is subject to the rules of the Cellular Telecommunications Industry Association (CTIA). The CTIA is an Association of “carriers” (the telephone companies that carry and deliver your messages), and their rules stipulate what material is considered inappropriate - typically violence, hate speech, profanity, and the endorsement of illegal activity. Text messages that contain inappropriate material will not get delivered and likely result in text blast companies terminating your service. If you would like further information about the benefits of SMS marketing, the best software to use to achieve maximum impact, or how to get started with your first text blast, free advice is available from our team of Client Success Managers. Our team will also be able to answer any questions about rules and regulations, and offer tips about the best way to generate engagement when sending a text message blast from a computer.